Now that all three kids are playing soccer I am spending A LOT of time at soccer games on the weekends. I needed something simple to make so I could continue to focus on the games so I started another Sophie bag. I love this pattern, it's easy, quick, doesn't take a lot of yarn but looks really nice when it is done. I am using some Paton's soy yarn and I'm really enjoying it. 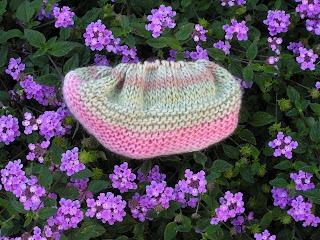 I am interested to see how it felts both because I haven't used this yarn before and because the colors are so light. I learned awhile ago that dark yarns felt better and quick than light yarns and this bag is pretty yarn. However, I really haven't gotten that far and the season is almost over . . . Last weekend the little man and I took a behind the scenes tour of the San Francisco zoo and had a wonderful time. We saw the lemurs up close, got to feed a bottle to a baby giraffe, pet a koala, went to the back of the bear cages and fed celery to a rhino. I's so glad we did it. Here is the little Koala we met. 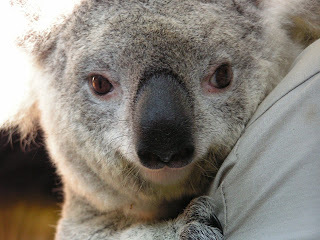 He was very soft with thick, thick fur - ever heard of koala yarn? I bet it would be wonderful. Check out Fryday Photo for another zoo photo. I have had many comments about my new bag.....thank you. I've decided to use the yarn on my new obssesion,Nordic Mittens with fingers: Glittens. 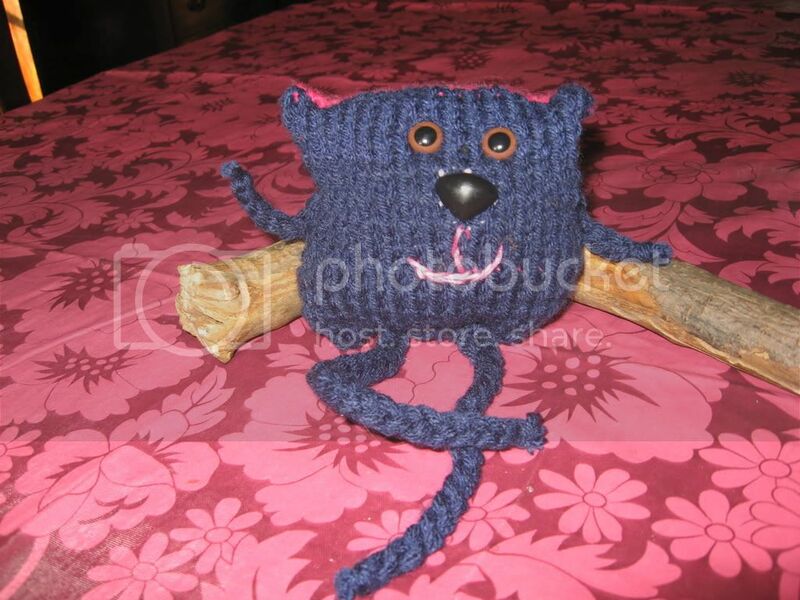 I've mentioned my childhood stuffed tiger on my blog before--my little sister had a stuffed koala. Your picture brings back memories of Dad opening his suitcase after a trip abroad, when we were very little, that had included a tour of the Steiff factory. Last time we went to the SF Zoo, it was one week before the Loma Prieta quake. I looked at the enclosures, and said to my husband, If those elephants got really spooked by a quake, there's nothing to keep them from charging up that hill and out of there. The elephants did stay put, a week later, but one of their wolves was seen running down the busy San Francisco street after the shaking stopped. I think you will like the way the bag felts, I've been very happy with that yarn! I have a Sophie bag ready to cast on as well. Love that pattern!! I love the colors you chose for the bag - maybe lighter shades in the soy will felt better. Great pic of the koala! Aw, so cute and cuddly.